Dharamsala News Update, Holi Colors ! Dharamsala News Update..Archive II, 2009..Holi Colors, Click the Graphic above !! Dharamsala News..Archive I, 2009..I Dare to Dream..Click Here ! The Earth Day...Green Dharamsala, 2009 ! Dharamsala News Update, April 22nd,2009: The Earth Day Celebration, Dharamsala, 2009, News Update, Dharamsala ! 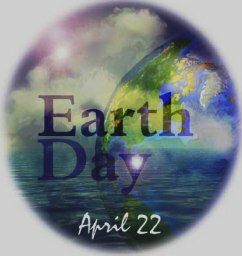 The Earth Day was celebrated all over the world moreso in the Himalayas. Dharamsala school kids had a field day enjoying nature walks, picnics and workshop on Saving Energy, Recycle using Natural Resourses. The Ancient Naina Devi Temple...Dharamsala, 2009 ! Dharamsala News Update, April 01st , 2009:The Navratra Series..The Ancient Naina Devi Temple, Kangra, Dharamsala, 2009, News Update, Dharamsala ! 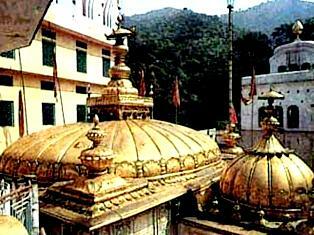 The ancient holy shrine of Naina Devi, stands on the Shivalik hills, of Himachal Pradesh. It lies north of the famous Sikh Gurudwara,Shri Anandpur Sahib in Punjab and millions of pilgrims visit every year during the 'Navratras'! Legend has it that, the sacred eyes of Goddess 'Sati' fell at this holy site making it a 'Shakti Peeth'(Energy Zone). Historically, the temple was made on the behest of a 'Gujjar'shepherd, when he discovered the Pind of the Goddess and saw her in his dream. The Ancient Chintpurni Mata Temple...Dharamsala, 2009 ! Dharamsala News Update, March 31st, 2009:The Navratra Series..The Ancient Chintpurni Temple, Kangra, Dharamsala, 2009, News Update, Dharamsala ! Chintpurni Devi is regarded as the Goddess who takes away all the worries of her devotees. The term 'Chhinnamastika' suggests 'without the head'. Here, the Goddess is depicted without her head in a pindi (phallic) form. Devotees come to this temple with a perpetual faith that the Goddess would bless them and fulfill all their wishes. It is said that nobody goes empty handed from the shrine of Goddess Chintpurni, 'Chhinnamastika'. During the time of Navratras, the temple observes grand fairs and festivity. People from far and near come to visit this holy shrine to seek the blessings from the Goddess. As per one legend, at the time of self-sacrifice, part of 'Sati's' feet fell at this sacred place and subsequently, a temple was built. Since, the temple is associated with the legend of self-sacrifice by 'Sati', the wife of Lord Shiva; it is regarded as the 'Shakti Peeth'(Energy Zone). 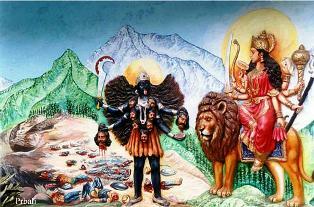 Another legend says, that Goddess appeared to slay two demons 'Shumbha' and 'Nishumbha'. After slaying the demons, the escorting friend of the goddess asked for more blood and the goddess cut her head to quench her thirst for blood. The Ancient Eternal Flame Temple..Jwalamukhi, Dharamsala ! Dharamsala News Update, March 29th, 2009:The Navratra Series..The Ancient Jwalamukhi Flame Temple, Kangra, Dharamsala, 2009, News Update, Dharamsala ! This ancient 'Shakti Peeth'(Energy Zone) of Goddess Shakti, is on top of a small hillock near Dharamsala India. The ancient flame, emerges out of a rock and the energy, is high in this valley. Legend says, that the tongue of 'Sati' fell at this holy site, which makes this pilgrimage a lifetime experience ! Even the Great Mughal Emperor Akbar, came barefooted here, to wish for a son and offered a golden chattra (umbrella) to the Goddess. The chattra turned into another metal because he was lacking in humility, when he offered it. This artifact, is still preserved, within the temple premises. Millions of devotees, throng this temple during 'Chaitra' (Spring) Navratra every year vibrant with mantras, hyms,devotional music and 'bhandaras'(community free meals). 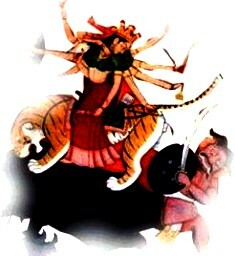 Shakti Brajeshwari Mata..A Battle with Demon King Mahishasur ! 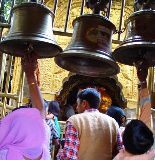 Dharamsala News Update, March 28th, 2009:The Navratra Series..The Ancient Brajeshwari Temple, Kangra, Dharamsala, 2009, News Update, Dharamsala ! This is one of the most famous 'Shakti'Peeths(Energy Zone) in the Kangra valley. Legend has it, that the chest of the Goddess 'Sati', the wife of Lord Shiva fell at this holy site, when Shiva roamed the Earth in grief and anger, with the dead body of 'Mata Sati' on his shoulders, when she committed self-immolation, at the Maha-Yagya (Havan)Agni-Kund, when she visited her father's palace. This temple follows a unique tradition, of worshipping the goddess. It is a tradition that every year, during the festival of Lohri, the Pindi of the Goddess is decorated with a layer of butter. It is believed that in ancient times, the Goddess had used butter to heal the wound she got during her battle with the Demon King 'Mahishasur', who she killed in a long battle. The sight of the decorated pindi, attracts a lot of devotees from places near and far. The 'Chaitra' Navratra has attracted millions of devotees to pay homage. The temple is vibrant with mantras, hyms and devotional music along with free community meals for all ! Spring 'Chaitra' NAVRATRA,Himachal, 2009 ! 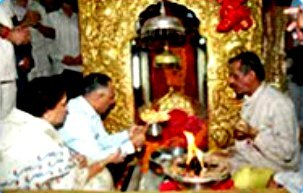 Dharamsala News Update, March 27th, 2009:The Navratra..Chamunda Devi Temple, Dharamsala, 2009, News Update, Dharamsala ! 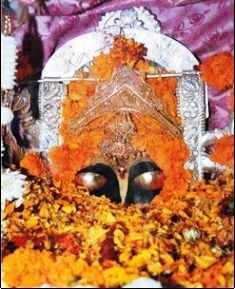 The 'Chaitra' Navratra, has started in the scenic Kangra Valley with the ancient Chamunda Temple, resounding with millions of devotees, mantras, holy hyms and music. The free community meals are available to the everybody irrespective of caste, creed or color. This is also one of the 'Shakti Peeths (Energy Zone) of Goddess Shakti who killed the two demons (rakshas), Chand and Mund by her reincarnate 'Kali' form. This is one of the 51 'Shakti-Peeths', of the Goddess. 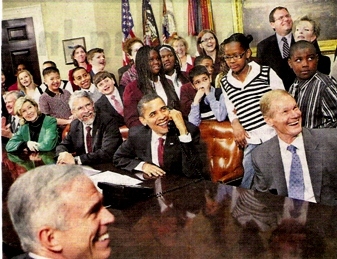 Communication..High, President Barack Obama with School Kids talks to Space Astronauts from the White House, 2009 ! Dharamsala News Update, March 26th, 2009:Barack Obama..Space Talk..Bridging the Space , Dharamsala, 2009, News Update, Dharamsala ! US President Barack Obama, accompanied by members of the Congress and school children, talk to the Astronauts on the International Space Station, from the White House, USA. A "happening net", might soon happen, with high resolution images and data, from Mars and the Moon being made available on worldwide telescope, by the effort of Microsoft Corporation. Dharamsala News Update, March 25th, 2009:Go Green with Pony TREKS..Himachal Beckons , Dharamsala, 2009, News Update, Dharamsala ! The lure of travel has fascinated Mankind, from time unknown..The mountains have challenged many and exhilirated their instincts for adventure..With the IPL Cricket Tournament globetrotting its way out of India to the summer season of Safariland, South Africa, there is a big hustle n' bustle among the kids and students for the sudden re-scheduling of their holiday plans post exams. While there is no part of India which is not incredibly beautiful, there is nothing like the fresh cool air of the mountains to beat the summer heat. 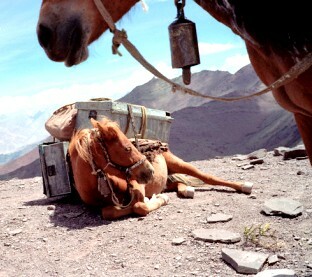 The mountains of Himachal Pradesh, offer the best of the outdoors for rejuvenating experiences. King Fisher Airlines, Air India & MDLR Airlines are running regular flights to Kullu, Dharamsala & Shimla while travelling on heritage trails can be enjoyed on scenic train journeys. Deluxe AC Coaches are also available for the major towns of this Himalayan state from Delhi. For more on Heal Green Himalaya...Click Here ! Dharamsala News Update, March 24th, 2009:Fairs & Festivals..Himachal Beckons , Dharamsala, 2009, News Update, Dharamsala ! With spring in the air, Himachal will soon be buzzing with a slice of traditional India..with the approaching vibrant village melas n' fairs, dotting the Himalayan landscapes. Music, Dances, Jewelleries, Costumes, Tasty Fun n' Food, Wrestling Bouts and Merry-Go-Rounds..maybe a little circus to end the day ! 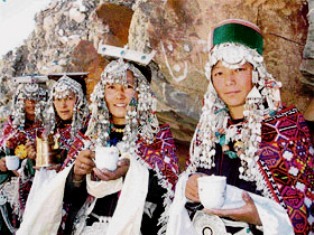 Himachali stone-studded silver wear is an ancient tradition for young village belles to highlight their beauty, during fairs and festivals where young gallants collect to court them. The jewellery is very colourful and trendy today. 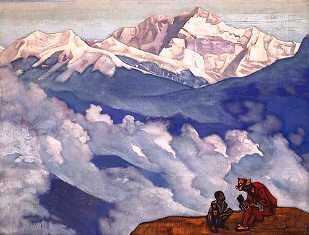 For more on the Art & Color of Himachal...Click Here ! Dharamsala News Update, March 23rd, 2009:Panorama of Mountain Birds , Dharamsala, 2009, News Update, Dharamsala ! During the springtime, Himachal Pradesh visited by many migratory birds becomes a virtual panorama of rainbow colors across the Himalayan skies and gurgling streams. 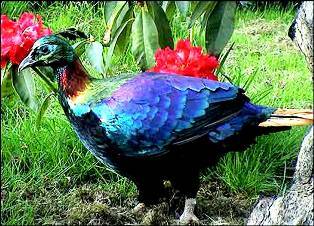 The Himalayan Monal, is the State bird of Himachal Pradesh.The male Monal,is very attractive with beautiful metallic colors of green, purple, red and blue and a large white patch on the rump with the crest, much like a peacock. Various birds can be sighted in the hillocks, conifer, pine trees and nearby natural streams. 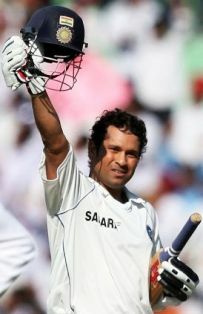 Dharamsala News Update, March 22nd, 2009:Sachin Shines , Dharamsala, 2009, News Update, Dharamsala ! Being mother to two growing children,..a son and a daughter, can be like going on a journey with two constant odds..while attending an important meeting in my office years ago in Kathmandu, the telephone operator, broke the office rules and informed me there was an urgent call..I had to go and attend it..it was my nine year old son studying in Lucknow, informing me with absolute glee, that Sachin Tendulkar had made a century !! Till today, Iam always looking forward to Sachin's centuries, to relive those moments again. His 42nd century at Hamilton test match, must have brought many smiles and cheers worldwide. Indeed a pride, for Cricket India having won the test match in New Zealand. Dharamsala News Update, March 21st, 2009:Apricot Spring Evenings , Dharamsala, 2009, News Update, Dharamsala ! The first shower of the season, the smell of wet earth breaking through the parched crevices of the soil, brought to my mind,..many years back..school socials and apricot evenings,we did not have lip gloss,..so we creeped into our matron's room and stole her freshly made apricot jam and applied it over our lipstick, which gave a lovely sheen ! 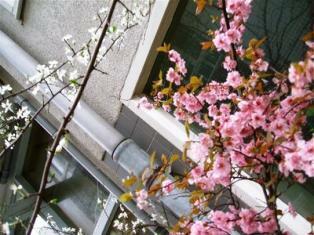 Black berry and apricot blossoms are a sight to see in Dharamsala these days. They look pretty with the fresh rain drops and sunshine around the hills. Visit Dharamsala for apricot evenings..
..Click here for Reaching Dharamsala ! Dharamsala News Update, March 19th, 2009:The Kangra Paintings, Dharamsala, 2009, News Update, Dharamsala ! 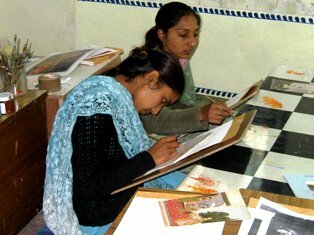 A weekly session of the classes are going on at the Kangra Museum in Dharamsala for the young artists to learn and paint the famous 'Kangra Miniatures', an ancient art of the Kangra Valley..a heritage to preserve. Dharamsala News Update, March 18th, 2009:The Nalwari Cattle Fair,Bilaspur, Dharamsala, 2009, News Update, Dharamsala ! The five day state level 'Nalwari Cattle Fair' in Bilaspur, Himachal Pradesh started with greta fan and fare, with a 'shobha yatra' starting from the Laxminarayan Temple to the ground. The cattles from the surrounding villages, gather for the cattle trade in this Himalayan region. 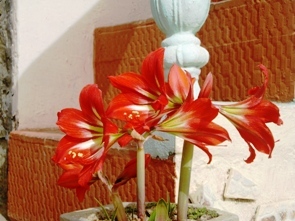 Vibrant colors, music, folk dances and wrestling are a major part, of this famous spring fair. 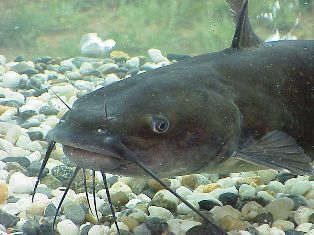 Dharamsala News Update, March 17th, 2009:Cat Fish..Rewalsar Lake, Dharamsala, 2009, News Update, Dharamsala ! The sacred lake of Rewalsar in Himachal Pradesh, India, attracts many pilgrims of different faiths of Buddhism, Hinduism and Sikhism. The sacred fish are fed for 'good karma', as goes the belief. For preventing harmful algae and pollution of the lake..catfish are being used to claer the water of this sacred lake specially during the Spring Fair. Himalayan High...Cricket Season, Dharamsala ! 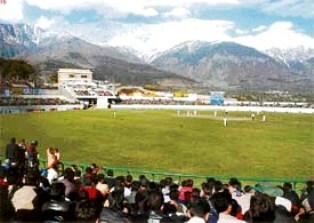 Dharamsala News Update, March 16th, 2009:Flavour of the Season..Cricket Dharamsala, 2009, News Update, Dharamsala ! With the sweltering summer heat catching up on us, the IPL Cricket Matches in the cool Himalayas of Dharamsala could well be the 'flavour of the season', keeping the cricket entertainment buzz, high in the list of Sports. The HP Govt. is brucing itself up for completing all the required arrangements in the new stadium. With the IPL series gaining global momentum in the Sports World..the Himalayan people can now look forward to hosting more one-day matches and perhaps an exclusive 'Himalayan High' team for the Himalayas ! 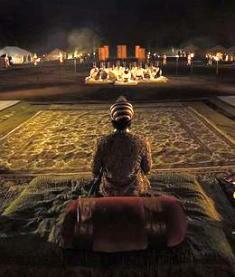 Din-E-LLahi..Emperor Akbar..Religion of Humanity ! And in my final hour, my place in Heaven ! " Dharamsala News Update, March 16th, 2009:Weekend High ..Good Humanity, 2009, News Update, Dharamsala ! There is much to be learnt in all our religions, which bring us only closer to our real self and on the road to discovery. Nearly all religions, have the concept of community meals. The Sikh Spiritual Head, Shri. Guru Nanak preached in his doctrine the role of an individual in destroying all evil and evil doers as a protector. In the community Kitchen..'Langar', any body can come and have a meal irrespective of caste, creed or color. Guru Nanak Dev valued the fertility of the Green Earth and considered cultivation of the land, as a must practise (seva) in the society. Born to a Hindu family, he believed the spirituality of the sacred 'Ganga'water should bless the harvest fields. In the sacred Hindu scripture,..the 'Bhagavad Gita', Lord Krishna has talked about 'Karma' as related to a Man's foremost 'Dharma'. Karma should be done with a good intention of protecting the weaker, sharing the food, knowledge and rising above the personal self, attachment and result for the obligation of the society welfare. Saint Valmiki, who was ordained by the 'divine' to write the 'Ramanayana' when he was inspired by an act of love between two birds though his early life was that of a roaming bandit. 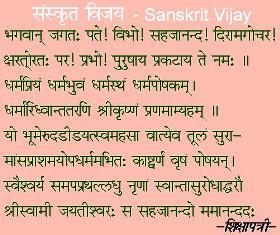 He is believed to have given shelter to 'Sita' in his forest ashram and teachings to luv and kush the sons of Lord Rama. Dharamsala News Update, March 14th, 2009:Easy Vibes, 2009, News Update, Dharamsala ! 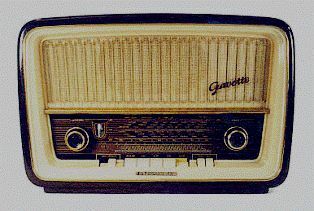 With communication being the keyword in today's world, Himachal Pradesh can now benefit from the services of the State's first Community Radio, launched by Chief Secretary, Ms. Asha Swaroop. This can be used in creating awareness and information in all the rural areas of Himachal. The Urban Development Ministry has in an attempt to make life more comfortable for the local villages, has made the town planning process more flexible for the rural areas, the focus of the Dept. being more on a comprehensive town planning policy which could benefit all. Dharamsala News Update, March 13th, 2009:Sanskrit College, 2009, News Update, Dharamsala ! During the annual fuction of the Sanskrit College in Jawalamukhi in Kangra, Himachal Pradesh the District Language Officer has informed that very soon the college will get a new building. 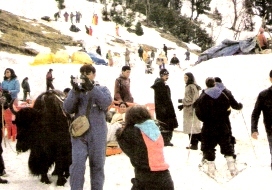 Dharamsala News Update, March 12th, 2009:Snow Fun at Rohtang, 2009, News Update, Dharamsala ! With the Himachal Valley, blooming with the colors of spring flowers, blackberry and apricot blossoms everywhere, tourists can be seen, enjoying the sun n' snow at Rohtang Pass in Manali, Himachal Pradesh. Dharamsala News Update, March 12th, 2009:Better Health Care, 2009, News Update, Dharamsala ! Dr Rameshchandra Deka, the new AIIMS Director, India's premier Govt. Hospital in India, has promised better patient care and more development on new medical research techniques. " I will try my best to discharge my duties, with utmost sincerity and honesty." Dharamsala News Update, March 08th, 2009:The Spring Chheeshu Fair in Rewalsar, 2009, News Update, Dharamsala ! 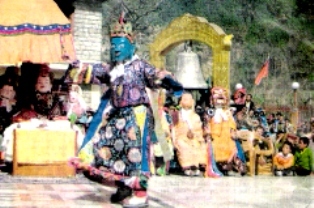 The sacred lake of Rewalsar in Himachal Pradesh just concluded the Spring Chheeshu Fair where the monastic mask dances were performed by the Tibetan Buddhist monks. Dharamsala News Update, March 07th, 2009:Towards a Better Future, 2009, News Update, Dharamsala ! A group of painters from Sweden held a workshop in 'global warming' thru the eyes of their paintings, to creat awareness among the people of Himachal Pradesh. The original art on environment and global warming was exhibited in Dharampur. This drive was initiated by Tellus Art, a Swedish NGO. The simple message of a global awareness to save Mother Earth was the prime objective behind this international effort and appreciated by one and all. Dharamsala News Update, March 06th, 2009:Towards a Better World, 2009, News Update, Dharamsala ! Dr. Vijay Mallya, noted Indian Corporate Leader has bought exclusive valuables of Mahatma Gandhi. We pray, that these national treasures, will always provide inspiration for a better world, to all the generations of the Global family. We wish a speedy recovery to the Sri Lankan Cricket Team in the afermath of the Lahore terror attack, and pray that the entire global sports fraternity will be together in promoting good will and a healthy sports culture worldwide. Dharamsala News Update, March 04th, 2009: Tomato/Potato Crop Insurance, 2009, News Update, Dharamsala ! 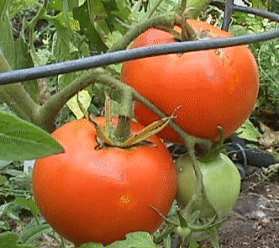 The Tomato and Potato Crop Insurance is on the line, ensuring risk free cultivation for the farmers in the Himalayan state of Himachal Pradesh, considering the soil is favourable for the crop. "Within you lies the Power of GOD ! "..Bhagavad Gita. Dharamsala News Update, March 05th, 2009: Preserving Gandhi, 2009, News Dharamsala ! There are some things, which no one can take away from us, as a Nation..our fluency over English as an adopted language.. Gandhi..Bhagavad Gita and so much more ! 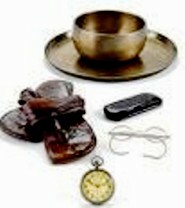 It is sad to hear, that some of Mahatma Gandhi's personal belongings are not with us in India, as Iam not aware, how they reached America in the first place..None the less, not withstanding our pitfalls as a Nation, our problems of a growing economy, our differences between the poor, the rich and our grudges between, those who rule us and those who get ruled, we still do firmly believe having Gandhi 'on a bargaining table is against the very grain of 'Gandhism' and 'Swabhiman'. Like President Barack Obama, rightly said in his first address to the Congress, " The Power of remedy lies within us..we as a Nation are entitled to our mistakes and capable of standing up from where we fall..all charity starts at Home..we must first be a good parent to be a good Government..a good neighbour, before we can become a good Global Citizen, the gist of it being, that we must first be strong ourselves, to be able to help others !" It would make me happy as an Indian, if the Mahatma's belongings were here but, not unduly worried..the world itself, cannot afford to lose the relevance of Gandhi, irrespective of where he belongs, the vision of Gandhi is truely priceless entrusting upon each one of us, the role of a Peace Catalyst in Global Harmony..preserving Gandhi, would truelly mean..practising Gandhism with a sincere effort and heart ! Any endeavour shorter than that, would make us lose, that all important bargain within us for Peace, which we need to win for the future of our children. 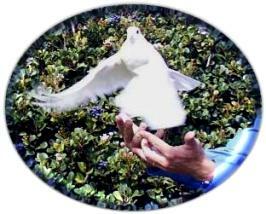 The onus of Gandhi, I believe, is the very essence of a Peaceful World ! "An ounce of practice is worth more than tons of preaching!!" ..Mohandas Karamchand Gandhi. Dharamsala News Update on India Miniguide News ...Click Here !